Juvenile specimen from the rio Uruguay. 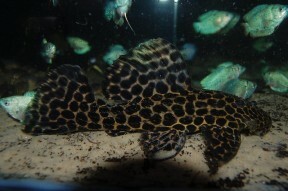 Megalancistrus: from the Greek μέγας (mégas), meaning ‘big, large, great’, and the generic name Ancistrus. parananus: named for the Río Paraná, type locality of the species. Distributed throughout the rios Paraná, Paraguay and Uruguay in southern Brazil, Paraguay, Uruguay, and Argentina. Type locality is ‘Río Paraná at La Paz, Entre-Ríos, Argentina’. The largest officially-recorded specimen measured 588 mm. Intestinal analyses of wild specimens have shown it to feed chiefly on freshwater sponges and other aquatic invertebrates alongside smaller quantities of wood, although it’s unclear whether the latter is an essential part of the diet or ingested unintentionally while the fish are foraging. In the aquarium it does best when offered a varied diet comprising sinking dried foods, frozen Daphnia, mosquito larvae, chironomid larvae (bloodworm), and prawn/shrimp, for, example, plus fresh fruit, parboiled potato, etc. Can behave very aggressively in confined surroundings and should only be maintained alongside similarly-sized, robust fishes in suitably-sized aquaria (see ‘Aquarium Size’). This species was formerly considered to be represented by the L-numbers L113 and L234 but it appears that only the former is native to the Paraná, Paraguay and Uruguay drainages, whereas L234 is collected in the rio São Francisco in eastern Brazil.